Sharifa Alkhateeb (June 6, 1946–October 21, 2004) was born into the only Muslim family in her neighborhood in Philadelphia, Pennsylvania. When confronted with different ways of thinking or living, she saw an opportunity to learn and grow. At the University of Pennsylvania, where she earned a degree in English literature, Alkhateeb joined the Muslim Student Association and began wearing a headscarf. Surrounded by the burgeoning feminist movement of the 1960s, she cultivated her own voice as an activist and leader on behalf of Muslim women. She later earned a master's degree in comparative religion from Norwich University in Vermont. 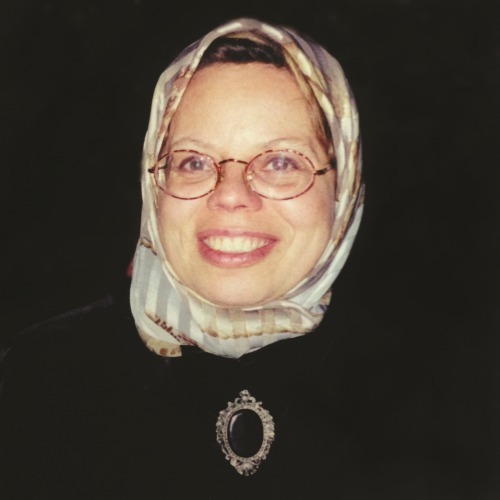 After moving to Fairfax County in 1988 she continued her work to create a better understanding of Islamic life and became known as a spokesperson on Muslim women in the United States. She founded the North American Council for Muslim Women and served as president of the Muslim Education Council. Working with Fairfax County Public Schools, she led a successful effort to offer Arabic as a foreign language in some high schools, served as a diversity trainer, and helped produce a monthly television program, Middle Eastern Parenting. In 2000 Alkhateeb started the Peaceful Families Project, a nationwide effort to research and raise awareness of domestic violence in Muslim communities. She participated in the Community Resilience Project of Northern Virginia to provide crisis counseling following the terrorist attacks on September 11, 2001. Shortly before her death from cancer, the Islamic Society of North America honored Alkhateeb with its Community Service Recognition Award. Image Courtesy of Maha Alkhateeb. “Sharifa Alkhateeb ,” Virginia Changemakers, accessed April 21, 2019, http://edu.lva.virginia.gov/changemakers/items/show/360.